Daily Lenses Dailies AquaComfort Plus Multifocal To see well at all distances! A perfect vision at all distances. With daily contact lenses Dailies AquaComfort Plus Multifocal in format of 90 you will have to copy the graduation of your last boxes of lenses purchased to be able to place the order. You will have to ask for one box for the right eye and another box for the left eye. For this reason you will have daily contact lenses for 90 days or 90 sunsets. Daily contact lenses Dailies AquaComfort Plus Multifocal, are daily lenses that are always kept hydrated thanks to the combination of three substances: HPMC (hydroxypropylmethylcellulose), PEG (polyethylene glycol and PVA (polyethenethen) .The HPMC guarantees comfort for hours nothing else put, and the combination of PEG and PVA keeps the lens hydrated throughout the day.This combination of substances ensures comfort for hours without drying the eyes.The AquaComfort Plus Multifocal Dailies are three times more moisturizing than usual contact lenses. 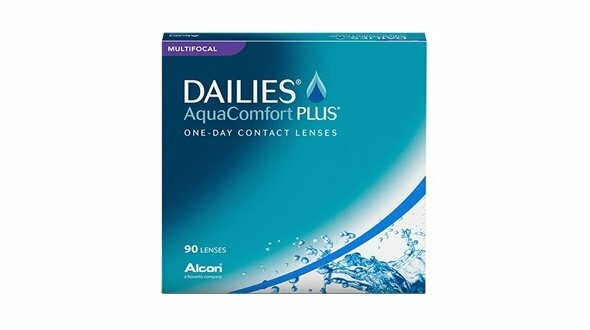 Therefore, Dailies AquaComfort Plus Multifocal daily lenses are indicated for people who want maximum comfort until the end of the day or who work a lot with computers or in dry and extreme environments. Presbyopia shares some symptoms with a vision of the future, but they are not the same. Hyperopia is caused by an irregular eye, while presbyopia occurs when the lens of the eye becomes less flexible, even in eyes without defect from afar. Presbyopia can be corrected with reading glasses, bifocals or multifocal lenses or multifocal lenses such as Dailies AquaComfort Plus Multifocal. This versatile contact lens allows you to see up close and far in each eye. It can also be used in monovision, where one eye has a contact lens to see up close, while the other eye has a contact lens to see from afar. Depending on the extent of the monovision, a single contact lens may be all that is needed. In Prodevisión you can acquire the Dailies AquaComfort Plus Multifocal lenses easily, comfortably and at very competitive prices, enjoying all the security of purchase and security. We are a serious company with many years of experience in the world of optics (contactologists, we adapt lenses daily in our center). We are professionals. When ordering your daily Dailies AquaComfort Plus Multifocal lenses in Prodevisión, it is necessary that the lenses have been prescribed by an optician or ophthalmologist, from there, you must place your order by copying the parameters of the last contact lenses box that you have acquired, that is, the first adaptation has to be done by the professional who will assess vision, movement of the lenses in the eye and also teach you the correct operation and maintenance of the lenses. Daily contact lenses Dailies AquaComfort Plus Multifocal are single-use, that is, they are placed in the morning and thrown at night, they should not be reused, since, being very thin materials, they can not be handled and can be broken by manipulating them or even inside the eye. Dailies AquaComfort Plus Multifocal daily lenses are economically viable if they are used a maximum of 3 times per week, if the demand or need to use lenses is greater, it is recommended to go to the use of monthly lenses.